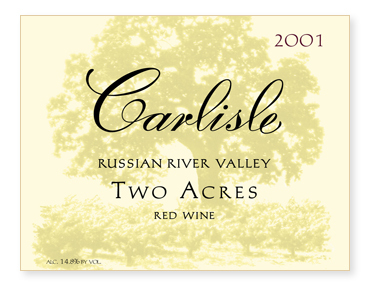 A wonderful Two Acres, each variety was picked separately at its peak of ripeness. However, the timing of picking was such that we were able to coferment (indigenously) the Mourvèdre and Carignane components as well as the Petite Sirah and Alicante Bouschet. After a total maceration of 18 days, the wine was pressed in to all French oak, only 16% new. After a couple of positive pressure/gravity return rackings and 16 months in barrel, the wine was bottled unfined and unfiltered in February of 2003.